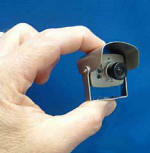 The Hawk Eye Nature Cam camera connects directly to your TV or computer. Comes with Color Video, Infrared Night Vision, Microphone, Weather Shield and 100' of RCA (audio-, video-in) Cable. Although the image is color, be aware that colors inside a birdhouse will, at best be muted. Infrared lights automatically take over when natural light levels are too low. Works best in shaded areas.